Hawaii Native Status: Cultivated. This ornamental garden plant is native to Brazil, and it has not yet become naturalized here in Hawaii. Description: The pinecone-shaped, 5 to 7 inch (13 to 18 cm) long, bracteate inflorescences are below the leaves at the stem tips. The small, white and pale purple flowers are nestled between the pale blue or white floral bracts on the inflorescences. The flowers are tubular and have 3 floral lobes and 3 sepals. The inflorescences are very long-lasting, but each individual flower only lasts for a day. The leaves are green above, pale green below, ovate-elliptic in shape, and pinnately-veined with parallel lateral veins. The plants grow from underground rhizomes. 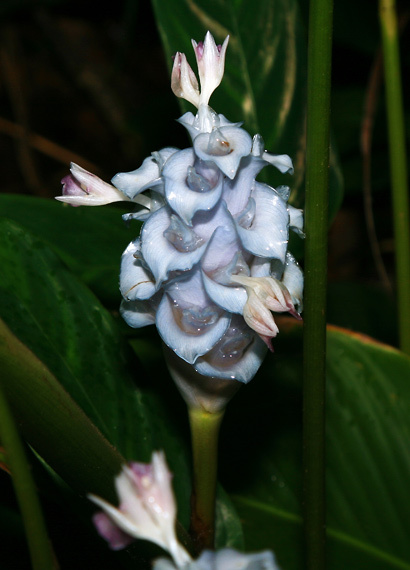 This plant grows in moist, humid, shady to partly shady tropical gardens. 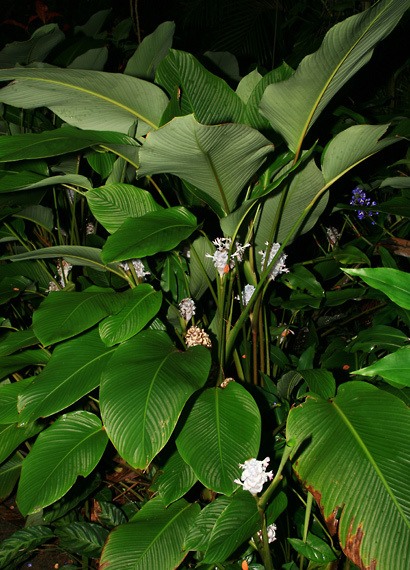 Because of its shade tolerance, Ice Blue Calathea is a good choice for planting under trees. The similar Green Ice Calathea (Calathea cylindrica) has green inflorescences and yellow flowers.